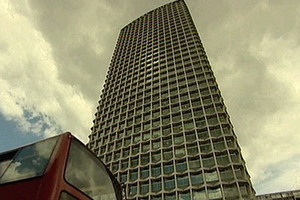 The property developer that owns London's Centre Point tower is on the brink of collapse after Lloyds Banking Group has threatened to foreclose on a £700m loan. Targetfollow – which owns sites at London’s Centre Point, Wembley Point and Baskerville House in Birmingham – was in talks with lawyers yesterday to tackle the financial problems. The company – founded by Ardeshir Naghshineh – owes Lloyds around £700m, but its commercial property assets have fallen since the loan was taken out in 2007. Conferences for up to 220 can be held at the Targetfollow’s Wembley Point or Baskerville House, while up to 160 can be accommodated at Centre Point. Naghshineh said: "The negotiations between the parent company and Lloyds Bank do not involve or affect day-to-day operations of our businesses, which are performing extremely well despite the difficult conditions. So at ground level it is business as usual and will remain that way. "We have presented a large number of viable solutions to Lloyds but they have all been rejected out of hand. Still, we have no intention of giving up, particularly as the independent valuations of our properties far exceed those put forward by Lloyds’ valuers." Lloyds’ advisor Jones Lang LaSalle has valued Targetfollow’s assets at £450m, but the property company’s valuer CBRE puts them at £680m.